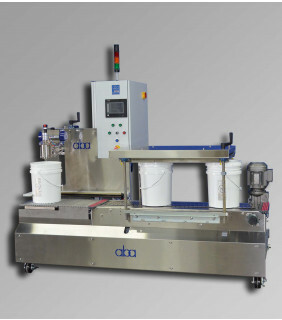 The ABA-TFGES-DRUM is an electronically controlled, top fill, net weight, semi-automatic filling machine designed to fill drums. With technological advancements in the field, electronic filling machines are helping our customers achieve faster and more accurate fills in addition to assisting with data acquisition and tracking. ABA is proud to offer its clients electronic filling machines with color touch-screens (HMI's) which are easily accessible by an operator, typically mounted on a pendant arm of the machine. Here at ABA, the standard PLC program allows for the use of separate line stops at every fill station, eliminating shingling caused by line pressure. 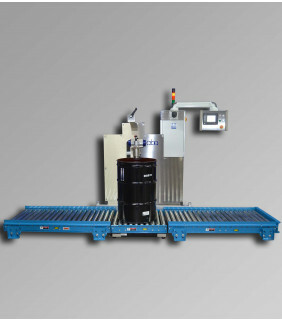 Any fill head can be operated independently, and changeover times between container sizes is significantly reduced because most sizes can be filled without having to move the centerline of the fill heads or move the container sensors and line-stops. 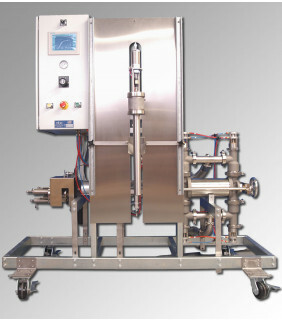 If your company is looking to make the most out of their liquid filling production sector, then give us a call. 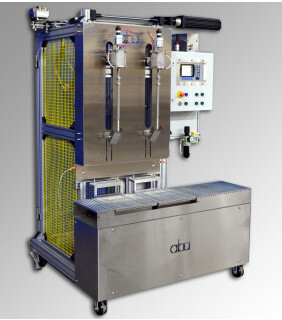 Our custom designed top rated electronic filling machines are the best on the market. Call or visit us today to speak to one of our professional representatives.